Greeks have been present in southern Russia from the 6th century BC; those settlers assimilated into the indigenous populations. The vast majority of contemporary Russia's Greek minority populations are descendants of Medieval Greek refugees, traders, and immigrants (including farmers, miners, soldiers, and churchmen/bureaucrats) from the Byzantine Empire, the Ottoman Balkans, and Pontic Greeks from the Empire of Trebizond and Eastern Anatolia who settled mainly in southern Russia and the South Caucasus in several waves between the mid-15th century and the second Russo-Turkish War of 1828-29. In former Soviet republics, about 70% are Greek-speakers who are mainly descendants of Pontic Greeks from the Pontic Alps region of northeast Anatolia, 29% are Turkish-speaking Greeks (Urums) from Tsalka in Georgia and 1% are Greek-speakers from Mariupol in Ukraine. Black Sea trade became more important for Constantinople as Egypt and Syria were lost to Islam in the 7th century. Greek missionaries were sent among the steppe people, like the Alans and Khazars. 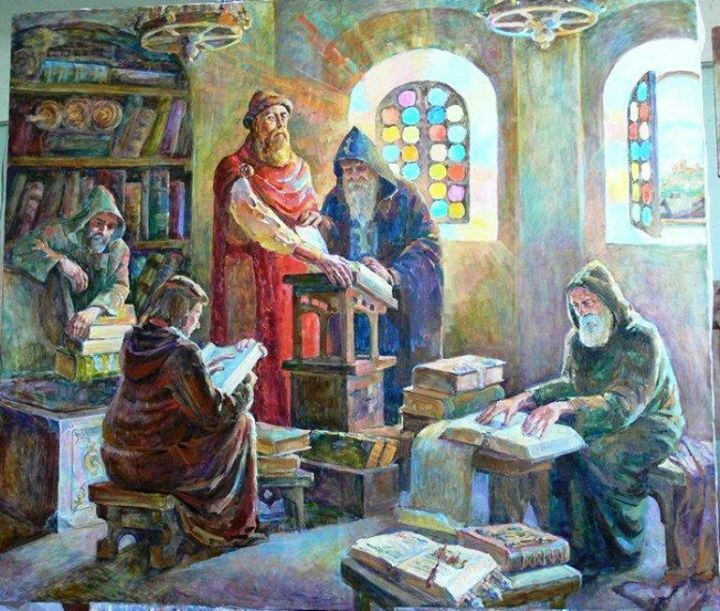 Most notable were the Byzantine Greek monks Saints Cyril and Methodius from Thessalonica in Greek Macedonia, who later became known as the apostles of the Slavs. Many Greeks remained in Crimea after the Bosporan kingdom fell to the Huns and the Goths, and Chersonesos became part of the Byzantine Empire. Orthodox monasteries continued to function, with strong links with the monasteries of Mount Athos in northern Greece. Relations with the people from the Kievan Rus principality were stormy at first, leading to several short lived conflicts, but gradually raiding turned to trading and many also joined the Byzantine military, becoming its finest soldiers. In 965 AD there were 16,000 Crimean Greeks in the joint Byzantine and Kievan Rus army which invaded Bulgaria. 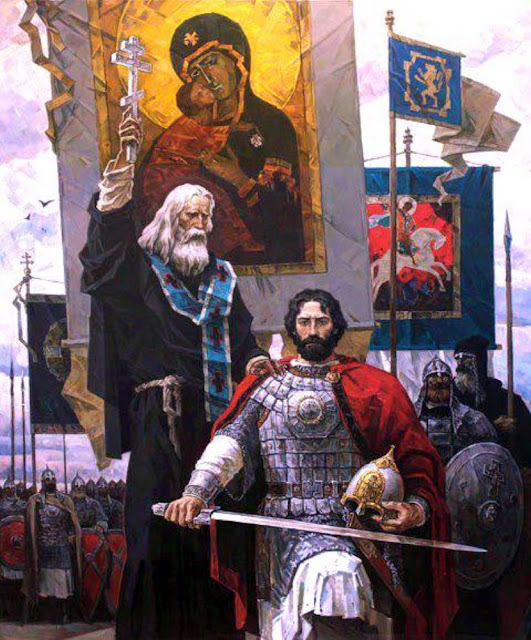 Subsequently, Byzantine power in the Black Sea region waned, but ties between the two people were strengthened tremendously in cultural and political terms with the baptism of Prince Vladimir of Kievan Rus in 988 and the subsequent Christianization of his realm. The post as Metropolitan bishop of the Russian Orthodox Church was, in fact, with few exceptions, held by a Byzantine Greek all the way to the 15th century. One notable such prelate was Isidore of Kiev. With the Fall of Constantinople in the 15th century, there was an exodus of Greeks to Italy and the West but especially to fellow-Christian Orthodox Russia. Between the fall of the Empire of Trebizond to the Ottomans in 1461 and the second Russo-Turkish War of 1828-29 there were several waves of refugee Pontic Greeks from the eastern Black Sea coastal districts, the Pontic Alps, and Eastern Anatolia to southern Russia and Georgia (see also Greeks in Georgia and Caucasus Greeks). Together with the marriage of Greek Princess Sophia and Tsar Ivan III of Russia, this provided a historical precedent for the Muscovite political theory of the Third Rome, positing Moscow as the legitimate successor to Rome and Byzantium. Greeks continued to migrate in the following centuries. Many sought protection in a country with a culture and religion related to theirs. Greek clerics, soldiers and diplomats found employment in Russia and Ukraine while Greek merchants came to make use of privileges that were extended to them in Ottoman-Russian trade. Zoe Palaiologina, who later changed her name to Sophia Palaiologina (ca. 1440/49 - 1503), was a Byzantine princess, member of the Imperial Palaiologos family by marriage, Grand Princess of Moscow as the second wife of Grand Prince Ivan III. Through her eldest son Vasili III, she was also the grandmother of Ivan the Terrible, the first Tsar of All Russia. 1) Michail Komneinos Afentoulief or Afentoulis was a Greek who lived in Russia and served as an officer in the Imperial Russian Army. He is best known for his participation in the Greek Revolution and his activities on the island of Crete during the period 1822–23. Michail Komninos was born in Nizhny Novgorod in 1769. He attended the Military School of St. Petersburg and reached the rank of Major in the Russian army. Following the outbreak of the Greek War of Independence in 1821, he came to Greece, following Alexandros Kantakouzinos. In the summer of 1821, along with Kantakouzinos, he went to Monemvasia upon the orders of Dimitrios Ypsilantis. There, Cretan rebels proposed to Kantakouzinos to take up the leadership of the revolution in Crete. After his refusal, Ypsilantis appointed Afentoulief instead. He arrived at Sfakia on 25 October 1821 or in the beginning of November on board the ship of Ioannis Vlachos, a citizen of the Ionian Islands, accompanied by Cretan soldiers. He also brought a small amount of food and ammunition to the island. His first act was the convening of a general assembly of the local military and political leadership. The nickname of "Afentoulis" was given to him by the Cretans. He was a capable and earnest soldier and administrator, but unable to adapt himself to the circumstances of Crete. In February 1823, Afentoulief left Crete and was succeeded by Neofytos Oikonomou as governor of Crete. 2) Vasily Nazarovich Karazin (1773 - 1842) was a Russian enlightenment figure, intellectual, inventor, founder of The Ministry of National Education in Russian Empire and scientific publisher. He is the founder of Kharkov University (now V. N. Karazin Kharkov National University). Karazin was born in Kruchik village, Kharkov Governorate, Russian Empire (now Bohodukhiv Raion of Kharkov Oblast, Ukraine), his father was Nazary Aleksandrovich Karazin, a Russian Imperial Army officer (noted for his involvement in Pârvu Cantacuzino's 1769 rebellion in Wallachia) and his mother was part of the Ukrainian Cossack elite. His paternal family originally known as Karadji stemmed from Greek people. 3) Konstantin Gavrilovich Catacazy or Katakazi (1830 - 1890) was a Russian diplomat of the 19th century, minister plenipotentiary of the Russian Empire to the United States. Katakazi is a Russian aristocratic family of Phanariote descent. Anton Katakazi, the patriarch of the family emigrated with his sons to Russia in 1807. The Katakazis were big landowners in the eastern part of the principality of Moldova, which was transferred to Russia the Treaty of Bucharest (1812). The family is mentioned in the catalogue of aristocratic families from the Bessarabia Governorate. Anton Katakazi's two sons got involved in Russian politics. The older son, Konstantin Antonovich Katakazi (1775–1826) was governor of Bessarabia from 1818 to 1825. Married to a princess Ypsilantis, Konstantin actively supported the Greek secret society Filiki Eteria and the military action of Alexander Ypsilantis in Moldavia and Wallachia. The younger son, Gavriil Antonovich Katakazi, became a Russian diplomat. His main assignment was legate of the Russian Empire to king Otto of Greece. Eventually Gavriil was named senator of the Russian Empire. Konstantin Gavrilovich Catacazy intended to follow his father's career and entered the staff of the Russian Ministry of Foreign Affairs. After having negotiated the Alaska purchase Stoeckl resigned for health reasons in 1869. Vladimir Andreevich Bodisko, former agent of the Russian-American Company was appointed as care-taker of the Russian legation in Washington Gorchakov suggested the appointment of Catacazy as minister plenipotentiary to the United States. Though Tsar Alexander II of Russia had some reservations regarding this nomination, he finally gave in to the chancellor's suggestion. 4) Grigorios Maraslis (1831 - 1907) was an official of the Russian Empire and long-time mayor of Odessa (1878–1895) of Greek origin. A noted philanthropist, he sponsored many buildings and educational institutions both in Odessa and in various cities in Greece and for the Greek communities of the Ottoman Empire. 5) Afrikan Aleksandrovich Spir (1837 - 1890) was a Russian Neo-Kantian philosopher of Greek-German descent who wrote primarily in German. His book Denken und Wirklichkeit (Thought and Reality) exerted a "lasting impact" on the writings of Friedrich Nietzsche. His mother, Helena Constantinovna Spir, daughter of the major Poulevich, was on her mother's side the granddaughter of the Greek painter Logino, who arrived in Russia under the reign of Catherine the Great. Alexander Spir gave each of his five children four boys and one girl names chosen in an old Greek Calendar, this is the source of the curious name "Afrikan". Although he spent most of his life as a philosopher, Spir never held a university appointment and his writings remained relatively unknown and unrecognized throughout his life. 6) Count Ivan Fedoseevich Botsis (died 18 May 1714) was a Russian admiral and one of the founders of the Imperial Russian Navy under Peter the Great. Botsis was a Greek from Dalmatia, and served in the Venetian galley fleet for 17 years. He was hired for Russian service by Pyotr Andreyevich Tolstoy in 1702. At the time, Russia was engaged in the Great Northern War and the Tsar tried to westernize Russia and establish a modern navy. Many foreigners were therefore invited to Russia and employed in high positions as experts. After his arrival in Russia in 1703, Botsis was appointed as shautbenaht (a Dutch title equivalent to Counter Admiral) and head of the galley squadrons of the newly established Baltic Fleet, based at Saint Petersburg and the fortress of Kronstadt. From this position, Botsis oversaw the construction of the Baltic galley fleet. In 1713 he commanded the rear guard of the fleet that carried the army of Prince Mikhail Golitsyn to Finland, and participated in the bombardment of Helsinki. His naval abilities and his character were highly esteemed by Peter: together with Vice Admiral Cornelius Cruys, Botsis was proxy father to the Tsar in his wedding to the Empress Catherine on 9 February 1712, and when Botsis died, the Tsar took his sword as a souvenir and gave pensions to his family. 7) Evstratii Ivanovich Delarov (c. 1740-1806) was a Greek-born mariner who served with several Russian maritime fur trade companies in Russian America. He was born in Ottoman Macedonia.He was the first documented Greek explorer and merchant to arrive in Alaska. Delarov's career in Russian America dates to at least 1764, when he was in the Aleutian Islands on board the Petr i Pavel under Ivan Maksimovich Solov'ev. While serving Panov brothers company, Delarov used the harbor on Unga Island as a base of operations, which for many years the harbor was known as Delarov Harbor or Greko-Delarovskoe, because Delarov was Greek. Over time Delarov gained a reputation as an excellent skipper. He became part owner of various fur-trading vessels. In 1788 the Spanish expedition of Gonzalo López de Haro and Esteban José Martínez sailed to Alaska to investigate Russian activity. A number of earlier Spanish voyages to Alaska had failed to find any Russians, but direct contact was made during the 1788 expedition. Haro found Shelikhov's settlement at Three Saints Bay and met with Delarov. Haro and Delarov conversed at length. Delarov informed Haro that there were seven Russian posts on the coast between Unalaska and Prince William Sound and that a Russian sloop traded south along the coast each year, as far as Nootka Sound. This latter piece of information was most likely a fabrication intended to intimidate the Spanish. That Delarov had exaggerated the strength of Russian America became clear to the Spaniards when they visited Unalaska. Delarov had told Haro that 120 Russians lived there, but the Spaniards discovered that Potap Zaikov was the only Russian there the rest were Aleuts. When the Russian-American Company was founded in 1799 Delarov moved to Saint Petersburg and served on the company's board of directors until his death in 1806. 8) Vasili III Ivanovich (1479 - 1533, Moscow) was the Grand Prince of Moscow from 1505 to 1533. He was the son of Ivan III Vasiliyevich and Sophia Paleologue and was christened with the name Gavriil (Гавриил). He had three brothers as well as five sisters. He was the son of Byzantine greek princess Sophia Palaiologina. 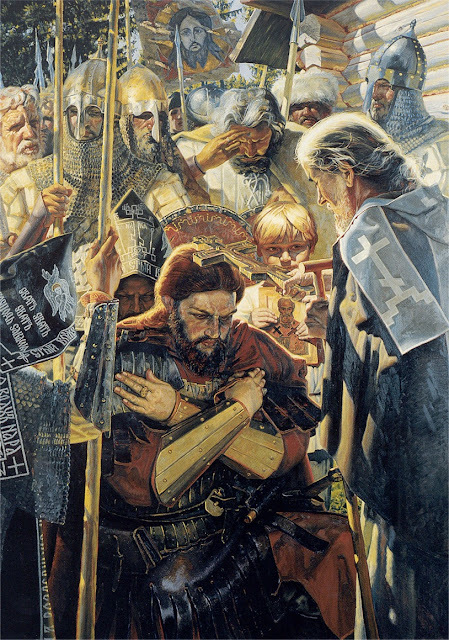 During the reign of Vasili III, the landownership of the gentry increased, while authorities actively tried to limit immunities and privileges of boyars and the nobility. Vasili was equally successful against the Crimean Khanate. Vasili III continued the policies of his father Ivan III and spent most of his reign consolidating Ivan's gains. Vasili annexed the last surviving autonomous provinces: Pskov in 1510, appanage of Volokolamsk in 1513, principalities of Ryazan in 1521 and Novgorod-Seversky in 1522. Vasili also took advantage of the difficult position of Sigismund of Poland to capture Smolensk. The loss of Smolensk was an important injury inflicted by Russia on Lithuania in the course of the Russo-Lithuanian Wars and only the exigencies of Sigismund compelled him to acquiesce in its surrender (1522). By 25 November 1533, Vasili reached Moscow and asked to be made a monk before dying. Taking on the name Varlaam, Vasili died at midnight, 4 December 1533. 9) Count Feodor Alekseyevich Golovin (1650 - 1706) was the last Russian boyar and the first Chancellor of the Russian Empire, field marshal, general admiral (1700). Until his death he was the most influential of Peter the Great's associates. Golovin stemmed from the family of Russian treasurers of Byzantine Greek descent. During the regency of Sophia Alekseyevna, sister of Peter the Great, he was sent to the Amur to defend the new fortress of Albazin against the Chinese Qing Empire. In 1689, he concluded with the Qing Empire the Treaty of Nerchinsk, by which the line of the Amur, as far as its tributary the Gorbitsa, was retroceded to China because of the impossibility of seriously defending it. On Leforts death, in March 1699, he succeeded him as Field Marshal. The same year he was created the first Russian count, and was also the first to be decorated with the newly instituted Russian Order of St. Andrew. The conduct of foreign affairs was at the same time entrusted to him, and from 1699 to his death he was the premier minister of the tsar. He also controlled, with consummate ability, the operations of the brand new Russian diplomats at the various foreign courts. His superiority over all his Russian contemporaries was because he was already a statesman, in the modern sense, while they were still learning the elements of statesmanship. His death was an irreparable loss to the Tsar, who wrote the words upon the despatch announcing it in grief. 10) Pyotr Ivanovich Melissino (c. 1726 – c. 1797) was a General of the Artillery of the Russian Empire and was widely considered the best Russian artilleryman of the 18th century. He was born as Petros Melissinos on the Greek island of Cephalonia in 1726, he was of Greek origi and his father was a physician who belonged to the noble Greek family of Melissenos. Throughout his life, he prided himself on his Greek origin. He received a thorough education in his youth and was fluent in many languages including Russian, German, Italian, French, Turkish as well as his native Greek, he also knew some Latin and English. Melissinos arrived in Russia during the reign of Peter the Great and ended his career as Vice-President of the Commerce Collegium in 1740-45. After the ascension of Emperor Paul, Melissino was put in charge of the entire Russian artillery but died the following year. Melissino was instrumental in promoting the career of one of Paul's favourites, Aleksey Arakcheyev. 11) Alexander Ypsilantis, Ypsilanti, or Alexandros Ypsilantis (1792 - 1828), was a member of a prominent Phanariot Greek family, a prince of the Danubian Principalities, a senior officer of the Imperial Russian cavalry during the Napoleonic Wars, and a leader of the Filiki Eteria, a secret organization that coordinated the beginning of the Greek War of Independence against the Ottoman Empire. He should not be confused with his namesake grandfather, a Prince of Wallachia and Moldavia at the end of the 18th century. At the age of 15, he was presented to the Russian Court, where he came under the patronage of Empress Maria Feodorovna. Although he was promoted to full colonel. 12) Count Ioannis Antonios Kapodistrias (1776 - 1831), was a Greek statesman who served as the Foreign Minister of the Russian Empire and was one of the most distinguished politicians and diplomats of Europe. After a long and distinguished career in European politics and diplomacy he was elected as the first head of state of independent Greece (1827–31). He is considered as the founder of the modern Greek state, and of Greek independence. In 1809 Kapodistrias entered the service of Alexander I of Russia. His first important mission, in November 1813, was as unofficial Russian ambassador to Switzerland, with the task of helping disentangle the country from the French dominance imposed by Napoleon. He secured Swiss unity, independence and neutrality, which were formally guaranteed by the Great Powers, and actively facilitated the initiation of a new federal constitution for the 19 cantons that were the component states of Switzerland, with personal drafts. In the ensuing Congress of Vienna, 1815, as the Russian minister, he counterbalanced the paramount influence of the Austrian minister, Prince Metternich, and insisted on French state unity under a Bourbon monarch. He also obtained new international guarantees for the constitution and neutrality of Switzerland through an agreement among the Powers. After these brilliant diplomatic successes, Alexander I appointed Kapodistrias joint Foreign Minister of Russia (with Karl Robert Nesselrode). As the Sublime Porte declined to answer the Russian ultimatum within the seven day period allowed after it was presented by the ambassador Baron Georgii Stroganov on 18 July 1821, Russia broke off diplomatic relations with the Ottoman Empire. 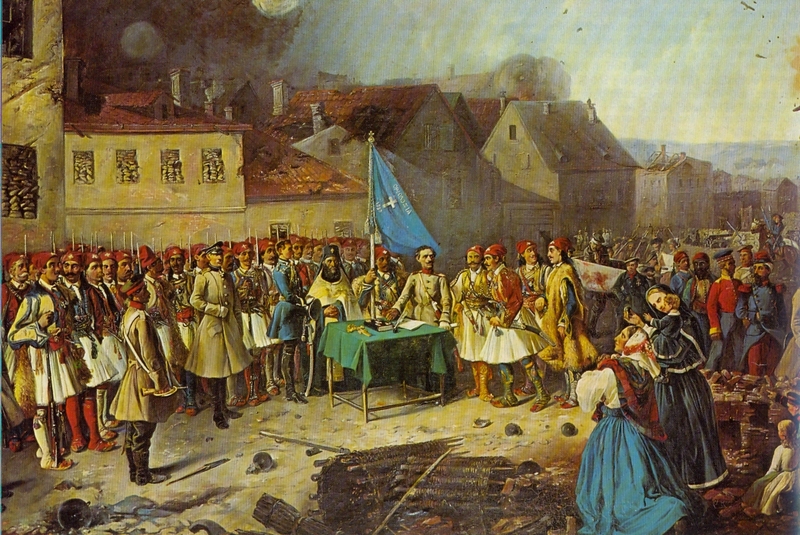 Kapodistrias became increasingly active in support of Greek independence from the Ottoman Empire, but did not succeed in obtaining Alexander's support for the Greek revolution of 1821. This put Kapodistrias in an untenable situation and in 1822 he took an extended leave of absence from his position as Foreign Minister and retired to Geneva where he applied himself to supporting the Greek revolution by organising material and moral support. Αναρτήθηκε από ΕΛΛΗΝΙΚΗ ΙΣΤΟΡΙΑ ΚΑΙ ΠΡΟΙΣΤΟΡΙΑ - GREEK HISTORY στις 3/19/2018 08:30:00 π.μ.